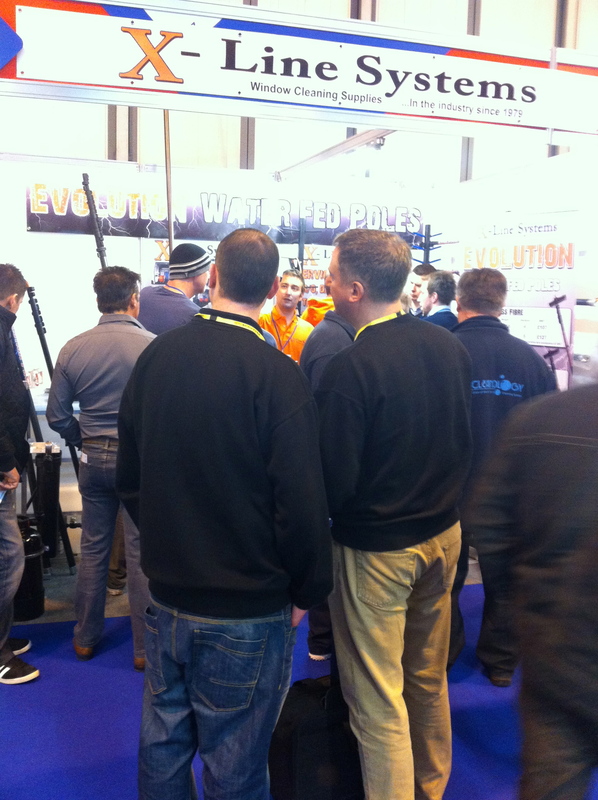 X-line Systems launched their new range of the Evolution water fed poles at ‘The Cleaning Show’ on the 19th of March 2013 and received loads of positive feedback and interest from within the window cleaning industry. James from X-line Systems was at first a little nervous with regards to exhibiting at this year’s Cleaning Show, mainly due to the lack of competition from other suppliers/manufacturers as he figured that this might mean a reduction in the number of window cleaners visiting the show, however, this seemed to of worked in their favour as their stand was really busy at all times throughout the 3 day period. X-line decided to opt for a stand next to a wall as this allowed them to extend and demonstrate the poles to visitors. The glue-less lateral clamps along with the aluminium base caps were major features that people loved. Everyone was pleasantly surprised how light, rigid and great value for money the poles were and they even managed to sell poles to multiple international window cleaners and distributers throughout Europe and then managed to supply two 50 foot carbon fibre poles to a company as far away as Brazil. The Evolution water fed poles come in 3 different varieties, glass fibre, hybrid & carbon fibre and range in size from 20 feet right up to 60 feet. The poles feature an aluminium base cap which allows the pole hose to exit from the side of the pole, which will help to protect the hose from wear and damage over time. The lateral style pole clamps are probably some of the best on the market as they grip the pole sections really well, have lots of room for adjustment when needed with no glue in sight. This means that replacing any clamps during the life of the pole should only take a matter of minutes. James also explained that “our hybrid poles are made up of 60% carbon fibre making them very light but at the same time surprisingly rigid, whereas our full carbon fibre poles are probably some of the strongest & lightest within the window cleaning industry. For example our Evolution Pro+ with a length of 20 feet only weighs 1,200 grams and retails for less than £200”. Xline Systems have also just upgraded and re-designed their website to showcase and sell all their custom made products which include the Evolution poles, static and van mounted filtration systems, portable trolley systems and pole hose and brushes. This new website also has a dedicated information section which answers some of the most frequently asked questions window cleaners have when deciding what type of filtration system or water fed poles are needed, either when upgrading from traditional methods or to complement existing pure water cleaning methods. 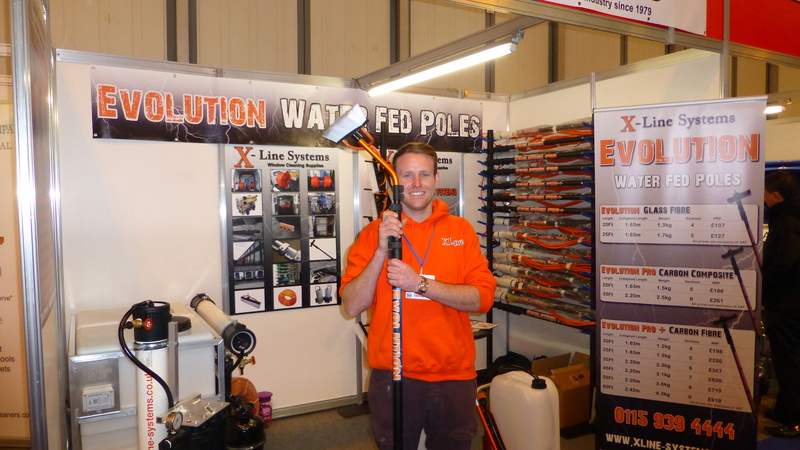 For more information on Xline Systems custom made products visit their website at www.xline-systems.co.uk or to learn more about the new Evolution water fed poles watch there video on the website which introduces the new range. ← 20 Blue cloths to be given away.